Whistler was one of the most controversial artists of the last part of the nineteenth century and delighted in puncturing the stuffiness of the English whose lifes he enjoyed enlivening. Yet despite his abrasive personality, his art is among the most subtle of his times. Whistler made it his mission in England, where he spent the latter part of his life, to attack the notion that the artist must portray the subjects upon which he worked recognizably, prefering instead to present the inner harmony that he felt when painting, etching, or making prints. His work moves from realism to Impressionism to Symbolism to Abstraction. 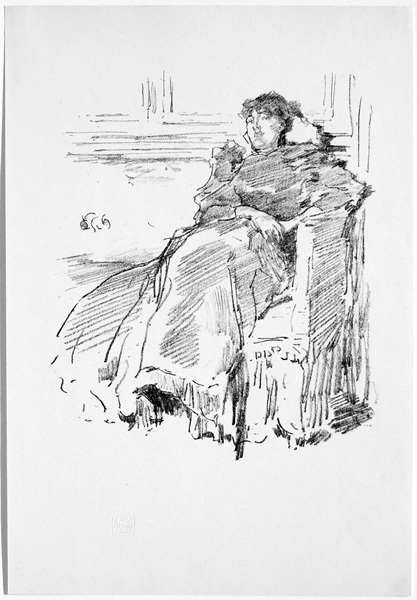 Selected Print Bibliography: Campbell Dodgson, The Etchings of James McNeill Whistler (London: The Studio, 1922); Ruth E. Fine, Drawing Near: Whistler Etchings from the Zelman Collection (Los Angeles: Los Angeles County Museum of Art, 1984); Edward G. Kennedy, The Etched Work of Whistler (San Francisco, Alan Wofsy, 1987); Mervyn Levy, Whistler Lithographs: An Illustrated Catalogue Raisonne (London: Jupiter Books, 1975. ); Katharine Lochnan, The Etchings of James McNeill Whistler (New Haven: Yale University Press, 1984); Margaret F. Macdonald, "Whistler's Lithographs," Print Quarterly V:1 (1988), 20-55); Carole McNamara, Whistler: Prosaic Views, Poetic Vision (Ann Arbor: University Of Michigan Press, 1994); Denys Sutton, James McNeill Whistler Paintings, Etchings, Pastels & Waterolours (London: Phaidon, 1966); Frederick A. Sweet, James Mc.Neill Whistler (Chicago: The Art Institute, 1968); Martha Tedeschi and Britt Salvesen, Songs on Stone: James McNeill Whistler and the Art of Lithography (Chicago: The Art Institute, 1998); Stephanie Wiles, ed., James McNeill Whistler & the Etching Revival (Middletown: Davison Art Center, 1999). Gants de suède / Suede gloves (Way 26, Levy 40). Original lithograph, 1890. Published in The Studio, 1894, with their blindstamp (lower left). Signed in the stone with the Butterfly (upper left). Ours is a very rich impression of this beautiful portrait of Ethel Birnie Philip. Image size: 186x150mm. Price: $1500. La Robe Rouge / The Red Dress (Way 68, Levy 98). Original lithograph, 1894. Published in The Studio, 1894, with their blindstamp (lower left). Signed in the stone with the Butterfly (upper left). Ours is a very rich impression of this beautiful portrait, newly returned from the conservator. Image size: 186x150mm. Price: $1500. Nursemaids / Les Bonnes de Luxembourg (Way 26, Levy 79). Original lithograph, 1894. Printed by Way (edition of 48) and Goulding (edition of 25). The work was first publisehd in The Art Journal. Ours seems to be a proof on parchment by either Way or Goulding before its Art Journal appearance. Leonardo da Vinci would have been proud of Whistler for his use of sfumato here to show the indistinctiness of the background against the clarity of the foreground. Signed in the plate with Whistler's Butterfly monogram lower right. Image size: 198x155mm Price: $1750. The Long Gallery at the Louvre (Way 52, Levy 83). Original lithograph, 1894. Published in The Studio, 1894, with their blindstamp (lower right). Signed in the stone with the Butterfly (lower right-center). Ours is a rich impression of this depiction of crowds at the Louvre, newly returned from the conservator. Image size: 200x140mm. Price: SOLD. The Smith's Yard (Way 88, Levy 126). Original lithograph, 1895. Published in The Studio, 1895, with their blindstamp (lower right-center). Signed in the stone with the Butterfly (above the stable, right-center). A very rich impression. Image size: 185x158mm. Price: $1350. The Doctor (Way 78, Levy 117). Original lithograph, 1895. As published in the first number of The Pageant (1896). 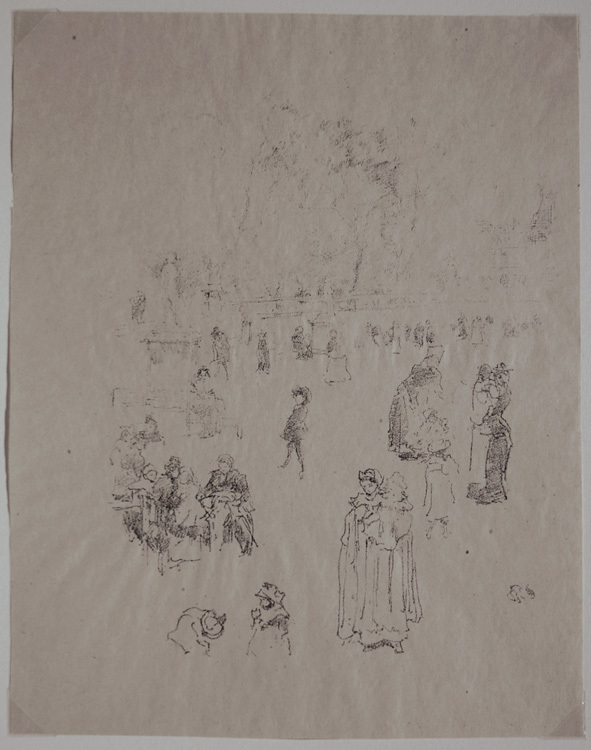 The work was printed by Whistler's favorite lithographer, Thomas Way. 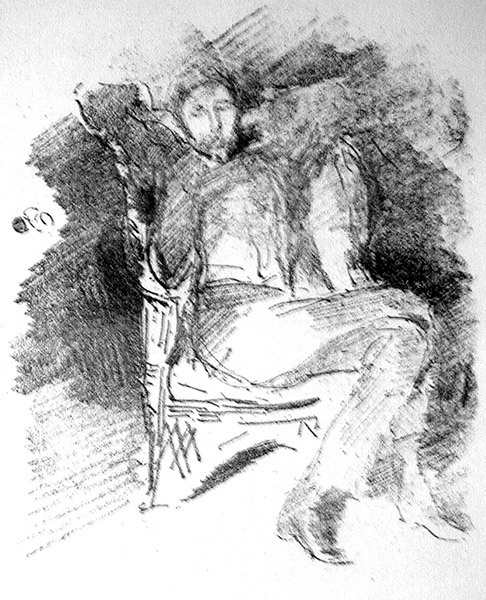 The subject is Whistler's brother, Dr. William Whistler. According to the Levy catalogue raisonné of Whistler’s lithographs, this piece is "Signed with the Butterfly," but there is certainly nothing that looks like the butterfly on “Firelight: Joseph Pennell“ or “La Robe Rouge / The Red Dress.” On the other hand, the butterflies in those two don’t look too much like each other. Immediately above and to the left of the doctor’s head there are three vertical parallel lines, the center one of which is actually slightly curved and has a small circular shape attached. If Levy is right that this work is signed in the stone with the butterfly and if we acknowledge that his lithographed butterflies exhibit considerably more individuality than his etched butterflies, I guess I would say that there, if anywhere in this piece, is the butterfly, but I’m not totally convinced that I would read those lines as a butterfly if Levy had not said that this work is signed with the butterfly Image size: 180x130mm. Price: $1500. Firelight: Joseph Pennell (Way 104, Levy 152). 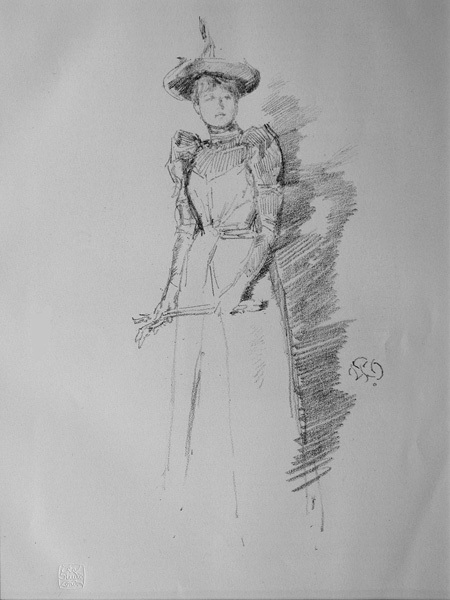 Original lithograph, 1896. As published in Lithography and Lithographers (1898) by Joseph & Elizabeth Robins Pennell. The work was printed by Whistler's favorite lithographer, Thomas Way. 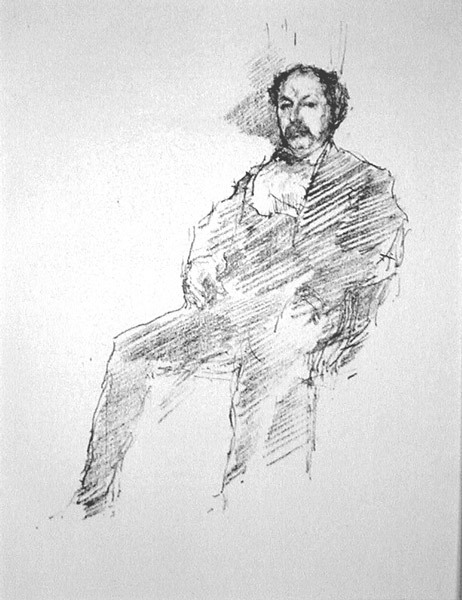 The subject is Whistler's friend and fellow artist, Joseph Pennell. Signed with the Butterfly in the stone (left margin, 3/5ths of the way up from the bottom margin). A very good impression. Image size: 165x140mm. Price: $1500. Savoy Pigeons (W. 118, L. 164). 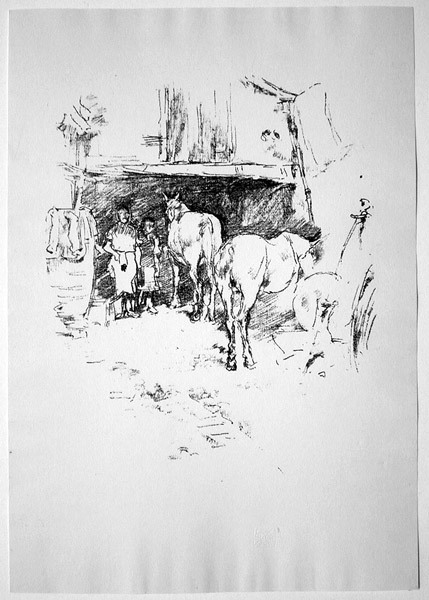 Original lithograph, 1896. 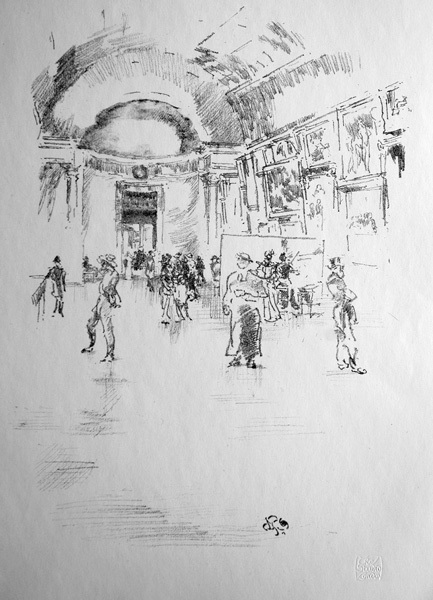 A very good impression on laid paper published in The Studio, 1896, with their blindstamp (lower left). Signed with the Butterfly (on the right below the pigeons); there are no pencil-signed impressions. 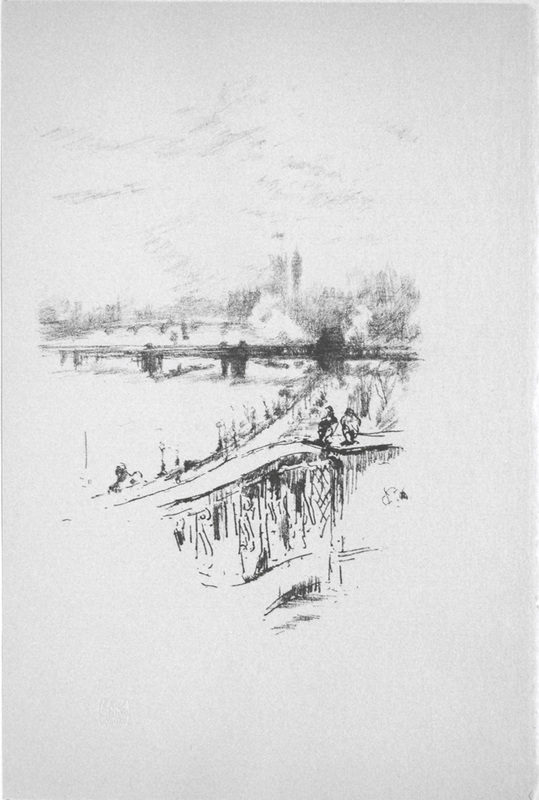 A view of the Thames looking towards Westminister, drawn from a balcony of the Savoy Hotel. A very good impression with a deckled edge at right. Image size: 200x140mm. Price: $1750.